Abby Rhodes had longed to own a business since she was a little girl, a dream she's achieved as the proud owner of Cheddar Box. WHEN ABBY RHODES PRESENTS A CUSTOMER with a grilled cheese sandwich—whether a two-cheddar classic on sourdough bread or a sandwich bread with bacon jam or guacamole—they’re getting much more than a mighty fine meal. 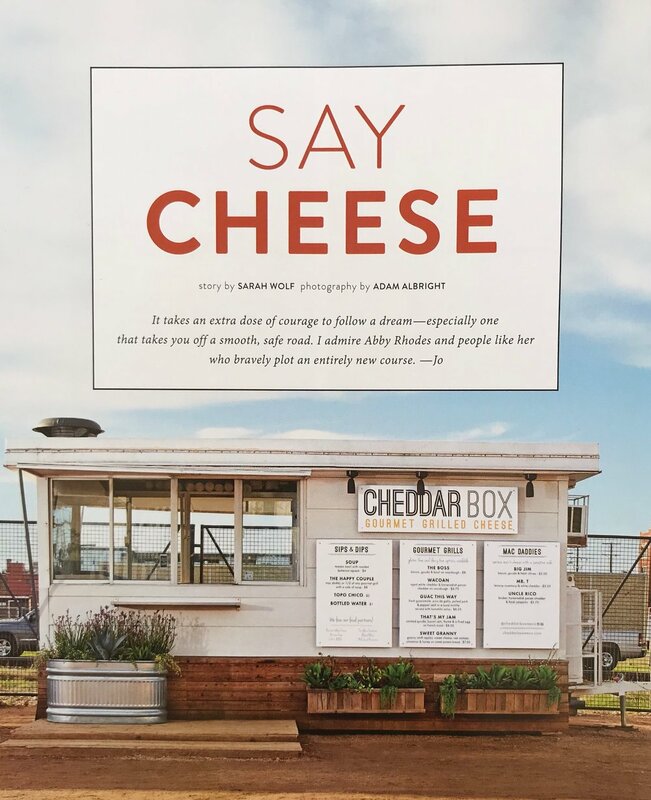 They’re also part of the ridiculously charming story of how that sandwich—and the food truck that produces it, Cheddar Box—came to be. And Rhodes can only marvel at how the whole story has unfolded. “There are two things I said I would never do in my life, and I’ve done them both,” Rhodes says. After 9/11, Rhodes said she’d never move to Iraq. Then she did—she taught English for a nonprofit organization there several years ago. And the other thing she said she’s never do was open a food business. “And here I am,” she sys with a laugh. One could say that she has been prepping for this role—nay, this calling—since she was a kid. “At age 10, I wanted to pretend to run my own business,” instead of playing with dolls, she says. When she hit her teen years, she actually did operate a couple of one-person shops—as a babysitter and car detailed—which she marketed with flyers mailed to families she knew. And in college she sold about $2,000 worth of her own handmade jewelry and seemed to be on an arrow-shot trajectory to business school and an MBA. But from the get-go it was clear that Rhodes had a gift not only for entrepreneurship but also for hospitality. But she was not in the food business—she’d vowed never to be, remember?—and instead spent dearly a decade as a speech therapist at a Waco, Texas clinic. Right around her 30th birthday, in 2013, Rhodes sensed a shift in her soul. Random idea after seemingly random idea popped up, all pointing in the same (seemingly random) direction: crafting grilled cheese sandwiches as a business venture. When Rhodes segued from a grill at the farmers market to a food truck at the Silos, she added macaroni and cheese (right) to the Cheddar Box menu, which already included sandwiches (like the best-selling The Boss, on the left). "Macaroni and cheese has always been my favorite food," she says. It comes in three varieties (Uncle Rico, with brisket, horseradish pecan cheddar, and fresh jalapeños, is shown), and it too is grilled on the flat-top. "That gives it a really cool texture," she says. "Some of the cheese gets crispy, some is chewy, and the rest is very melty. Our tagline is, 'So cheesy, you'll think we're kidding.'" Rhodes is a hands-on owner, always wiling to fill in if something comes up or an employee needs time off. She also raves about the Cheddar Box team. "They support the vision and make it happen," she says. "I can go out of town for two days and not think twice about the business because the people on the team carry the responsibilities - they own it." “And in that moment,” she says, “the dream and passion to start a business reignited”—but this time, instead of jewelry or car washes, she’d be selling sandwiches. Succulent, toasty, hot-off-the-flat-top grilled cheese sandwiches with approachable ingredients so that customers wouldn’t be scared off, but fancy enough that a meal would be a treat—not something they could just make at home. Rhodes began brainstorming with friends about low-risk opportunities to try her idea. A friend had started a crepe stand at the farmers market in downtown Waco, and that seemed like the perfect avenue and audience for grommet grilled cheese. So, every Saturday, starting in August 2014, Rhodes and a partner set up a stand and crafted ooey, gooey grilled cheese for the hungry masses at the farmers market. Wacoans flocked to the new venture. Jessica, eight months pregnant a the time, even jumped in to cut sandwiches and hand them out to customers to keep the lines moving. It was around this time that Rhodes had the chance to cater on the set for Chip and Jo, and they were really impressed. So much so that they asked Rhodes to open a food truck on the premises of the Magnolia Silos, which were about to open in downtown Waco. For two years now, Rhodes and the Cheddar Box team have served a streamlined but sublime menu of cheese sandwiches and mac ‘n cheese, all cooked to hot, melty perfection on the truck’s flat-top grill. Five sandwiches (including one that’s on the sweet side) and three flavors of macaroni round out the options, and customers can even opt for gluten-free bread or vegan cheese. Many of the products are sourced locally. She also feels strongly that she’s “called to make money to give money.” It’s an axiom she inherited from her grandmother. Rhodes is learning what that saying means for the owner of a business that went form selling 5,000 items in its first year to 100,000 items in its second. Cheddar Box's best-selling sandwich, The Boss, deftly combines Gouda cheese, bacon, and fresh chopped basil on sourdough bread, all cooked to toasty perfection on the truck's flat-top grill. Shown here is the gluten-free bread, an option that's so tasty a lot of the truck's staffers choose it over the (also delightful) sourdough bread. Local bakery, Baked Bliss, developed the recipe specially for Cheddar Box.